Gary Samore, senior fellow for non-proliferation at the International Institute for Strategic Studies answered your questions in a LIVE forum. President George W Bush says he will present fresh evidence to the UN next week about Iraq' s weapons programme, and has vowed to lead a military campaign if the Iraqis do not disarm. He listed a number of banned weapons Iraq had failed to account for and accused President Saddam Hussein of lying to the world. Meanwhile UK Prime Minister Tony Blair says there is evidence that al-Qaeda "operatives" are being sheltered in Iraq. It is the first time that the British Government has explicitly linked al-Qaeda and the Iraqi regime. As the pressure on Iraq increases, Mr Blair will continue to hold talks with world leaders ahead of his meeting with the US president later this week. Is war inevitable? Is the evidence against Iraq stacking up? 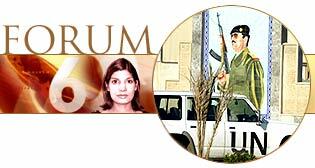 Hello and welcome the Six Forum. In his State of the Union address, President Bush appeared to be readying his country for war on the basis of new intelligence proving Iraq's involvement with al-Qaeda. That fresh evidence will be presented, he says, to the United Nations Security Council in a week. In the meantime, a spokesperson for Tony Blair at home in Britain has for the first time explicitly linked al-Qaeda to the Iraqi regime. So the pressure on Iraq is mounting. But public opinion still appears to weigh in favour of avoiding a war. Joining me is Gary Samore, non-proliferation expert at the International Institute for Strategic Studies. I just want to point out that you were special assistant to President Clinton, so you've been involved in US politics which is going to come in very handy in this discussion. First of all I want to put a question that we received from Ghassim Karim, Michigan, USA: Why didn't Bush provide evidence to the United Nations from the very beginning? We have to wait until next week. My understanding is that some of the evidence that Secretary Powell will present next week will be fairly recent information. It involves efforts by the Iraqis to move materials and equipment from sites that are about to be inspected and indications that the Iraqi authorities are ordering things to be moved around or warning plant directors that the inspectors are on their way. So some of this information will probably be of fairly recent vintage. In addition there's always a big debate in any government about whether or not to make information public and run the risk of jeopardising intelligence sources or methods. I'm sure there's been a very ferocious debate in Washington and it sounds like the Bush administration has decided that for supreme political reasons in order to strengthen its case and justify itself to publics, it has to make that information public. I'm sure that in your career history, you've been in the throes of such debate. But handling public opinion, as you say, is a difficult thing and the pubic appear to be becoming very confused because they see this as perhaps a last minute scramble after the UN weapons inspectors' report. Caroline Dudgeon, Cyprus asks: It is hardly surprising that we all so confused, the criteria for war on Iraq changes daily. Only two weeks ago Tony Blair told a parliamentary select committee during a "live recording" that there was no evidence linking Iraq with al-Qaeda terrorists. So is the Government going back on its previous statements and the goalposts being shifted? I don't actually know what kind of information there is linking Baghdad to the al-Qaeda network. My understanding is that the information involves individuals associated with al-Qaeda who are hiding out in Iraq and that suggests that at least maybe some tolerance on the part of Baghdad. I don't think that will be very persuasive in terms of convincing people that Baghdad had something to so with the September 11th attacks on the United States or that there's a great gain there that Saddam Hussein will provide weapons of mass destruction to terrorists. Although I do believe that President Bush thinks that somehow Saddam Hussein probably had a role in September 11. I think President Bush believes that there's a real danger that Saddam Hussein would provide chemical or biological weapons to terrorists. So in terms of President Bush's motivation, I think September 11 had a profound effect on his willingness to tolerate the threat from Saddam Hussein and I think President Bush has decided in his own mind that the only way to disarm Iraq is by military force to change the government. We've received a text message from Rob in Derbyshire, UK: We can't afford to wait on the question of Iraq. Here's a regime that some of us think could drop a dirty bomb in a city somewhere else anytime. Is this actually so? I think the risk of a dirty bomb is probably fairly minor. I think the greater risk would be the use of chemical and biological weapons. Of course currently, there's no capability in Iraq to attack targets that are at long distance, such as in the United Kingdom. The only way chemical or biological weapons could be delivered would be through the use of terrorists or intelligence forces or specials services. I think the risk of Iraq is no so much directly to the United States or the United Kingdom as it is in the region over time if Saddam Hussein is able to rebuild his military capability, his conventional forces, chemical, biological, nuclear forces. That would once again put Iraq in the position of threatening other countries in the region, potentially dominating other countries or even invading other countries, as of course Iraq has done twice in the last 20 years and potentially controlling oil resources which are extremely important to all of our economies. So, in my view, the threat from Iraq is more as an aggressive state seeking to dominate the region than it is a direct threat to the homeland of either the United Kingdom or the United States. Again there are other people who have different views - President Bush in particular - but in my view, the threat from Iraq, to the extent that a war can be justified, or at least efforts to try to contain Iraq, is justified more by the threat he poses in the region. Of course there are differing at the United Nations. Let's bring in the role of the United Nations. Steven, New York asks: The UN resolution requires active cooperation from Iraq and promises serious consequences if it fails to comply. Hans Blix has reported that Iraq has failed to provide active cooperation. Surely serious consequences therefore are now justified? I think President Bush and Prime Minister Blair would completely agree with that sentiment. But there are other countries on the council - in particular France, Russia and China who would certainly not defend Iraq's record of cooperation - they would certainly not claim that Iraq is complying with Resolution 1441. But they view the risks of war as so great that they would like to try to allow more time to persuade Baghdad to actively co-operate and they would set a much higher standard of evidence or a much higher standard of non cooperation that would justify war. Now over, I think, most of February we're likely to see a very intense debate in New York among the permanent members of the Security Council with the United States and the United Kingdom trying to persuade - especially France and Russia - that Iraq has really failed the last opportunity given to it by Resolution 1441. For the credibility of the Security Council, as the questioner suggested, it's absolutely essential that the council back up its threats with deeds and authorise the use of force. Personally, I think there's a pretty good chance, unless there's some dramatic change in Baghdad's behaviour, that you will see some kind of Security Council agreement to at least find Iraq in non-compliance, thereby implicitly authorising the use of force. It's even possible to have a second resolution that explicitly authorises member states to take all necessary means in order to enforce the resolution. Unless Iraq changes its behaviour in some really dramatic way, I think its chances of blocking a Security Council agreement are pretty weak. With that you're talking about Iraq perhaps changing its behaviour. Many members of the public get the impression that no matter what, President Bush wants to go to war in Iraq - he's pushing this case. With that we've had a text message just in from Mark in Wolverhampton who says: The USA is part of the United Nations. Surely the USA should obey the United Nations. In the case scenario that Iraq does dramatically change its position and the UN says there is no case for war, what does America do then? I think it would be very, very difficult for the United States or for President Bush to justify a war and all the risks that are involved to the American public and to the international public if Iraq dramatically changed its behaviour. Whatever his personal views or preferences, if Iraq were to truly cooperate in all of the areas that Dr Blix laid out on Monday in his report to the Security Council. For example, if Iraq were to announce that its search teams had discovered previously undeclared quantities of chemical and biological weapons and made that available to the UN inspectors to destroy. That's the kind of dramatic activity that would make it very hard for the United States to justify the use of force. Of course there'd be many people in Washington that would be extremely sceptical and who would believe that Saddam is just dealing with it at the last minute to save his skin and as soon as the threat of force was removed, he would go back to his usual game of trying of trying to limit the activity of the inspectors or produce new material. But at least in the meantime, I think that if Iraq wants to avoid a war, it really does have within its own power the ability to prevent a war. Michael Drayden, USA: What could a war accomplish that inspections cannot? I think certainly war can be a much more effective instrument of disarmament than inspections. Inspections can be very good at some things but at the end of the day, inspections and in particular inspections of a country like Iraq, which, as Dr Blix said, really hadn't committed itself to disarmament. At the end of the day there's a risk that the inspectors would find their freedom of access limited or even completely expelled, which happened in 1998. So war in a sense is a much more permanent way of dealing with disarmament if it results in changing the government and putting in place a government that's much more committed to not pursuing weapons of mass destruction. Now that doesn't mean war is necessarily a preferable course of action because war obviously kills a lot of risks that inspections don't. But in the sense of what is the most effective instrument of disarmament, I think you have to concede that war is actually more effective than inspectors. While we've been on air, our Online viewers have been telling us what they think of the evidence against Iraq and 80% of you say there isn't a convincing case for war. Gary, very briefly, should the Government actually be releasing more information? I think that both Washington and London recognise that they are facing sceptical publics, both at home and abroad and they're facing a diplomatic mood to try to build a stronger coalition as possible in order to reassure their publics. So I expect that when Prime Minister Blair and President Bush meet this Friday at Camp David, they will agree on a game plan to try, in the month of February and perhaps even beyond, to get some kind of Security Council backing to authorise the use of force and they will hope that that action will help to convince the publics that what they're doing is the right thing. Gary, thanks so much for being with us. Thanks for joining us and goodbye.